On perhaps the coldest night we have experienced in the UK since the early months of January and February this year, it's only fitting that I'm craving something fiery and warming to drink. Add to that, it's Guy Fawkes' night - so with the smell of bonfires on my walk home and fireworks bursting outside my window as early as 6:30pm, my mind does little to escape the words like fire, burning, warming and hot. When you read this the true festivities of Guy Fawkes' may have been and gone, but by no means do the parties need end, because, well, it's Friday, which means it's the start of another weekend! And so I come to the point; 5 Fiery Spirits to End Bonfire Week With a Bang! These five make the cut for clever naming, clever packaging and/or the addition of ingredients like chilli, ginger and cinnamon to warm the cockles. With a sweet anise aroma and a hefty whack of red chilli this syrupy liqueur is an Italian anise liqueur with chilli essence, by popular brand, Sambuca. Now, if I'd put that into the title you'd probably have skipped this one, am I right? Yes, it's Sambuca, but with a fiery chilli kick this is Sambuca on overdrive and dare I say it, a little more complex than you're average Saturday night shot. Think sweet chilli and star anise (if you get a chance to savour the flavour after pulling that Sambuca face....you know the one), this is fiery and fun. Serve as a shot - there really is no better way. A great one to take to a party. Find online at Master of Malt where it's £18.50 for a 70Cl bottle. A balancing act of smooth Early Times whisky, rich brown sugar and intense cinnamon spice, Fire Eater might look a little gimmicky, but actually tastes surprising delicious. Smooth and warming as it slides down your throat with a blast of hot cinnamon in a dramatic fiery finale. Claiming to be 'The Greatest Shot on Earth' might be a little OTT, however, one shot of this will certainly see you perk up - unless of course, you don't like cinnamon. This is not for cinnamon haters! If shots aren't your style, you can always take neat, on the rocks, and sip it slowly. Currently on offer at £14 for a 70Cl bottle in-store and online at ASDA. We've found this bottle on awesome gift site Toxic Fox for £32.99 (for a 70Cl bottle). Yes, it's pretty pricey for a bottle of vodka, but look how FUN the packaging is! 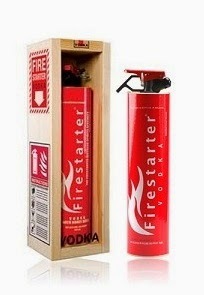 The Fire Starter tagline is 'When we say hot, we mean party' which is a little cheesy, but it looks like a mini fire extinguisher!! It's a five times filtered vodka produced and bottled in Moldova. Okay, so it's not got any additional flavours like the others on my list, but the packaging ties in with the whole fire theme. Serve neat, super chilled, or use as part of a cocktail. Good old Corky's - creating every flavour under the sun to serve on Friday and Saturday nights all across the country (and Monday, Tuesday, Wednesday and Thursday nights in student bars!). This one is infused with a spicy ginger flavour, perfect for autumn nights. Serve as a shot (like you'd find most Corky's flavours) or jazz it up with apple juice and lemonade for more subdued apple and ginger fizz. Pick up a 70Cl bottle online from Drink Supermarket for £12.14 (where you can also pick up other Corky's flavours). Why not try making your own spicy spirit? This is really, really simple and it makes a great gift for booze loving friends at Christmas (only 47 days to go!). Serve neat, super chilled if you're feeling brave, or use as a base for Bloody Marys with extra kick! 1. Slice the 2 large chillies and mix with the vodka in a large bottle or jug. Leave to steep for 5-6 hours, or overnight. 2. Strain out the chillies and pour back into the original bottle. 3. Pop in one or two chillies to make it obvious it's going to have a kick! Want just one more for good luck?? 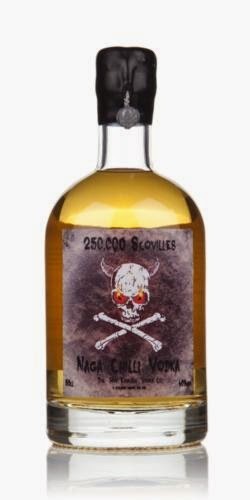 I'll admit I've chickened out of actually trying this (and I love chilli) but the tasting notes I found on the Master of Malt website for the 250,000 Scovilles Naga Chilli Vodka (£32.95 for a 50Cl bottle) were just too good not to share with you. Nose: It smells like the devil’s tears, with a side of Agent Orange mixed with Pepper Spray. Ben, Ben please don’t make me drink this, can’t we just guess how it tastes? It just seems wholly unnecessary to drink it. Palate: Oh it’s not so bad. No it’s fine really... Oh, actually it’s quite hot… Wait a second… Oh what have you done… Mooo… Moooooooooo. Moooooooooooooooooo. Yaggarrhrhhh….